Egypt and Art > Tour Map of Egypt > Tour Abu Simbel Directory > The God Re-Harakhte. . . . . .Ramesses, like all pharoahs was given more than one name. His birth name is Ramesses, which means Re has Fashioned Him. The name he aquired when he assumed the throne of Egypt is Usermaatre Setepenre. We would call him The Justice of Re is Powerful, Chosen of Re. We can see his name repeated not only in this picture above but all over Egypt. No other pharoah was a diligent as Ramesses was about having his name carved onto everything. . . . . .Centered on the face of the temple we find this curious scene. 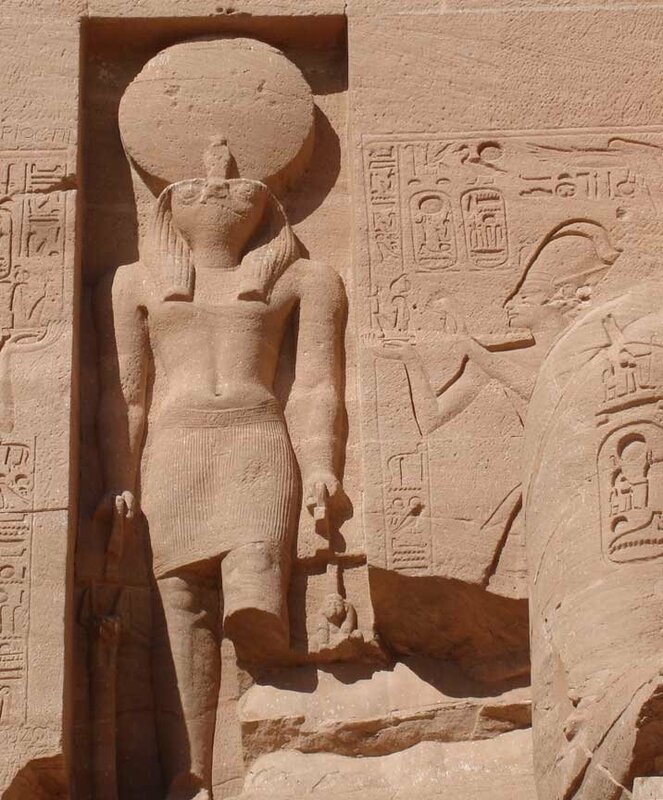 We see the pharaoh Usermaatre (Ramesses) steping in from the right side of the photo, he is wearing the battle crown. He is offering a symbol that represents Usermaatre to the large carved statue of Re-Harakhte who is holding in his right hand a staff made of the user symbol which is a stick with the head of a jackel. In his left hand he hold a staff of the goddess Maat. . . . . .So what we see above is the pharoah Ramesses (Usermaatre) giving the gift of himself (the symbol of Usermaatre) to himself as the falcon headed god Usermaatre-Harakhte.